This feature originally ran in PC Gamer magazine. To subscribe to either our US or UK edition and have great, exclusive features like this sent to your door every month, head here. Explosions are some of gaming's most dazzling effects. Ever since Doom's toxic barrels let players turn demons into soup, developers have striven to make explosions bigger, more spectacular and more dynamic. Today, explosions appear in all sorts of forms for all sorts of purposes, whether it's starting a revolution in Just Cause, or triggering a tactical chain reaction in Divinity: Original Sin. In a matter of moments, explosions can change dramatically in size, shape and colour. They can be triggered by the player in all kinds of different ways, and radically alter the existing game state. But how do development studios actually tackle these stunning, violent and oh-so-fleeting effects? Chris Judkins is principle VFX artist on Just Cause 4, which aims to continue the series' tradition of offering plentiful explosive potential. Judkins states that a good explosion starts with research. "Explosions act drastically different depending on what's blowing up," he says. "Fuel and gasoline produces dark, churning, slow-burning smoke that lingers for a long time, while propane burns fast, bright and violently. Keeping these factors in mind and staying consistent throughout the game helps make the explosions feel grounded in the world." Regardless of what kind of explosions a VFX artist is designing, a successful combustion is always founded upon the engine's particle system. "Particles determine not only the look of an explosion, but also details the movement," Judkins continues. "Even in a realistic-looking game we make a lot of stylistic decisions to help the explosions have more impact and wow factor, just like in Hollywood movies." Most of the time, the effect starts out as a visualisation of points in space "just to get the timing and movement the way we want it", Judkins explains. The visual effects like fire and smoke are added in afterward. It's also important to note that, while most explosions effects involve some kind of animation, they are often highly dynamic, a blend of simulation and script. "They need to respond to many external factors. An explosion will look different depending on what type of surface is around it, if there's a heavy wind blowing, if it's moving at high speeds," Judkins points out. "Having sophisticated particle simulation helps us create effects that hold up visually in all these types of scenarios." From this point, there are many ways designers can make blasts look impressive. "Making explosions pop requires more than just particles—things like camera shake, controller rumble, and full-screen effects like blurring and color adjustments all work together to make the experience more immersive." This is the basic process through which the Just Cause 4 team designs its explosions. But it's worth pointing out that different developers have varying approaches to explosion design. Divinity: Original Sin II is a very different style of game from Just Cause, that nonetheless features many kinds of explosions in its tactical turn-based combat. Like the Just Cause team, Larian started designing its explosions using real-life references. But the way it uses particles is slightly different. "In other big engines, particles use various hacks to fake smoke volume via normal maps or light direction renders," says Tiphane Franchomme, VFX artist at Larian. Divinity's explosions are constructed using particle 'emitters' (which are sort of like invisible fountains for particles), these can have their parameters tweaked in various ways, such as whether they emit sparks or not, and the scale and spread of the resulting emission. "Every time an explosion is spawned, it can choose between three explosion instances that have variations: one has explosion cloud, the other [has] just the shockwave and so on," Franchomme adds. Of course, the visual element of an explosion is only part of the story. The core of any explosion is the game’s particle system. Originally, explosions were composed of sprite animations, but today’s explosions combine animation with particle simulation, resulting in explosions that respond dynamically to other in-game elements, such as weather. Every explosion is different. The Just Cause team starts by referencing real-world explosions. "A lot of time is spent tweaking the timing, animation and colours of an explosion to make sure that it’s impressive and readable both close up and at a distance," says VFX artist Chris Judkins. The sound of an explosion is just as important as how it looks. Audio effects are also based upon real-world samples, mixed by a sound engineer to suit the game. They then need to be synchronised to the in-game effects, and balanced so that they appear to be coming from the right location. Alongside how they look and sound, explosions in games influence the environment immediately around them. "Explosions are also tied into our physics system, so that the force of the explosion pushes and breaks things like buildings or trees around it," Judkins explains. No matter how impressive the visual render is, an explosion isn't going to make much of an impact if there's no bombastic sound to accompany it, and this is where the audio designer takes the reins. "To make a believable explosion sound, it is not enough to simply find a good sound effect," says Marcel Zinatulin, sound designer at Larian. "Also important [is] how this sound is implemented and played inside the game. And to achieve good results we used various tricks in our work." Just as particles are the foundation of how an explosion looks, an eruptive audio library is the basis of the explosion's rumble. "To make powerful and interesting sounds we used special audio libraries with real explosions, recorded by professional engineers. Later we edited this material in various ways inside an audio editor to create final assets which suited our visual and gameplay needs." Once the desired effect has been produced, the audio engineers then proceed with implementing that sound into the game's world, synchronising the explosion audio with the visual effect, and balancing the sounds appropriately so that they appear to be coming from the correct position relative to where the player's camera is positioned. Once this has been finalised, the engineer can then begin to add their own creative flair onto things. "One of the tricks we used was explosion sequences of large surfaces. Instead of a single big explosion we used smaller separate explosions triggered in a sequence which looked and sounded more interesting and dynamic," explains Zinatulin. "Another important trick we used was a dynamic mixing. When an explosion happened in the game it muffled, in real time, less important and smaller sounds like birds, insects or ambiences. And making this dynamic contrast we could underscore better the power and importance of these events." This is how audio and visual design work together to create a virtual explosion. But videogame explosions tend to be more than aesthetic devices. In most cases, they'll affect the game state too, destroying some objects and flinging others across the environment. This is where the systems designers become involved. In Divinity, there are two different categories of explosion. The first is explosions created by spell impacts and other explosive weapons. The second is those generated by elemental interactions with the game's innovative surface system. "The first kind is simply playing a VFX at the target point and applying gameplay effects to suitable targets in a given radius," says Nick Pechenin, systems designer at Larian. While this sounds straightforward, this can produce all kinds of weird effects. After all, this is Divinity we're talking about. "Technically our explosions have the power to not only deal damage and apply statuses, but also interact with our surface system and perform esoteric stuff like turn all characters caught in the blast into cows," Pechenin adds. "The second kind of explosions occurs when two surfaces, for example oil and fire, are combined in one space. The system looks up the result of the combination and in this case replaces oil and fire with a short-living explosion cloud. Clouds, such as steam or smoke, are just a second layer in the elemental surface system. The explosion cloud is similar to other clouds, with two exceptions: it always lives in real time, and it can only affect characters once." Indeed, one of the most fun properties of explosions is that they often lead to further explosions, as anyone who has played either Divinity: Original Sin or Just Cause will understand. "When a player targets an oil barrel with a fireball, three explosions take place," Divinity's Pechenin says. "First, [the] fireball plays its explosion, deals fire damage in the area and creates [a] fire surface. Then the barrel is scripted to play another explosion when it receives any fire damage. Finally the barrel releases its oil, which reacts with [the] fire surface created by the fireball, spawning a short-living explosion cloud." Such chain reactions are some of the most satisfying experiences in all of gaming. But it can also cause a developmental headache, as every additional explosion requires more processing power to render. Hence, developers need to anticipate how many explosions the player is likely to either deliberately or accidentally set off and find a way to compensate for that. In Divinity this is less of a problem, as each combat encounter takes place in a fixed space. Consequently there's a limit to just how much carnage the player can cause. 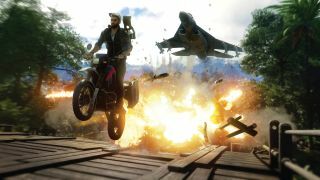 In Just Cause, however, the player's destructive capabilities are far less constrained, and so it's the job of the engine to keep things under control. "Our engine does a lot of work to keep track of which effects are relevant to the player at any given time, based for example on where the player is positioned or what direction they are looking," says Judkins. "When a lot of action is happening, resources are diverted to make sure that explosions are running smoothly, and ambient effects such as waterfalls and wind gusts receive less priority, much like how sound works." In this way, videogame explosions are more than just a cool effect, they epitomise the collaborative nature of game development. These fleeting, momentary events require the input of talented designers with (at least) three very different skillsets, all working closely together to create something that looks reliably awesome while also being in constant flux. Indeed, far from being a destructive force, videogame explosions are a fiery symbol of the industry's astonishing creativity.